These Dies are for use with MSD Pro-Crimp Tool(121-35051). This heavy-duty MSD Pro-Crimp Tool has interchangeable jaws that allow for a variety of crimp styles. With a hardened steel frame and cushioned handle, the slick ratchet action of the Pro-Crimp consistently provides factory quality crimps. 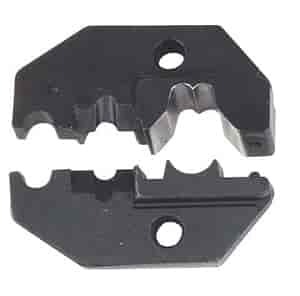 The tool is supplied with precision crimping/stripping jaws for MSD's spark plug terminals (121-3508). 3508 is rated 5.0 out of 5 by 1.